← Dinner at Bubba Gump Shrimp Co.
My husband is very fond of Purefoods hotdogs (the regular kind), but I’m getting tired of buying the same thing week after week. While looking for something new to buy in the frozen food section of the supermarket, something interesting caught my eye. I lifted a pack of these Purefoods Smoked Turkey Franks, closely examined it, and realized that it was something my husband could like. It’s made from turkey and it had less fat, plus they’re really big, but of course, they’re also more expensive than the regular hotdogs. 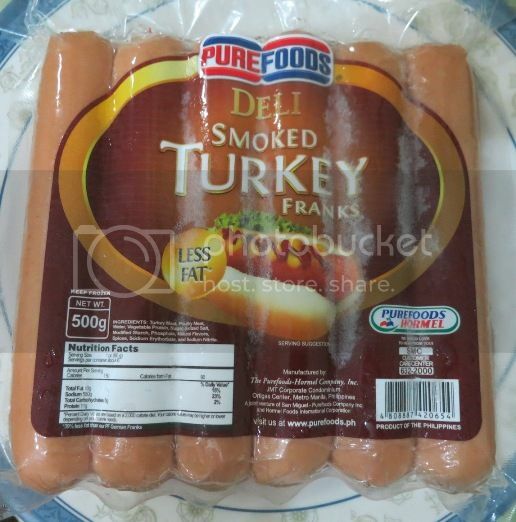 What we realized after trying out these Purefoods Smoked Turkey Franks is that they were more chewy than regular hotdogs but they’re not salty like most hotdogs, and we really enjoyed its smoky flavor. This entry was posted in Purefoods Smoked Turkey Franks. Bookmark the permalink.